that it would look just like [the United States in] 1951, and he was right. In six hours, I put together a small portfolio of 20-25 stocks, about $100 million total. One example was Daehan Flour Mills. It has a 25% market share in wheat flour in South Korea. Today, the U.S. economy is growing, unemployment is low, and the S&P 500 Index reached new highs during the third quarter. At the same time, interest in emerging market stocks appears non-existent and is worsening as an increasing number of emerging market stocks reach new 52-week lows. In our view, emerging market stocks have become too cheap to ignore. Accordingly, we have been increasing our capital commitments to emerging markets. As U.S. stocks rallied in recent months contemporaneously with the decline in emerging market stocks, we have been selling our clients’ fully valued U.S. equities, where appropriate, and selectively buying emerging market stocks that appear to have a favorable risk-reward profile at current prices. Without knowing when these emerging market stocks will bottom out, we are confident that the long-term return of our recent emerging market commitments should be attractive and should compare favorably to a passive investment in the S&P 500 Index. Although the rest of the world continues to generate faster economic growth than the United States, investors seem convinced that the United States is in much better shape than the rest of the world. We believe this consensus view is incorrect: every country has a unique set of problems, and there is little to suggest that the United States has fewer problems than the rest of the world. 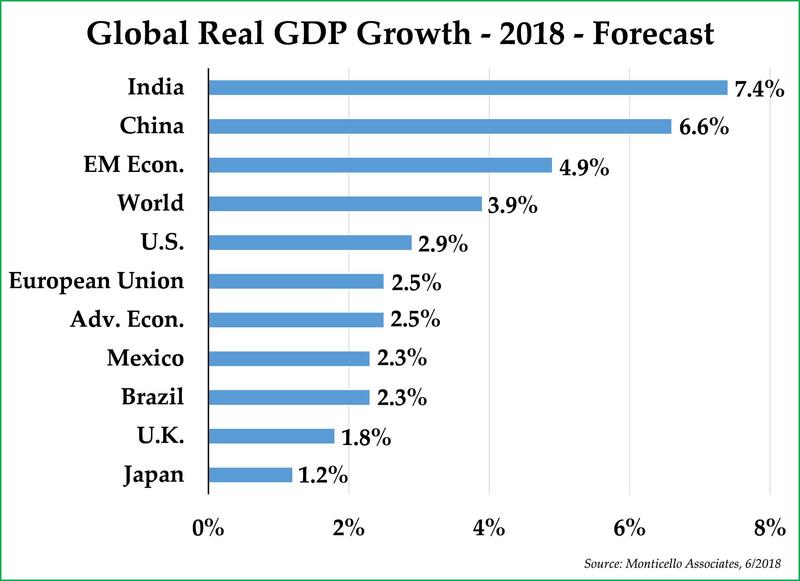 Indeed, even this year, with the U.S. economy growing at almost 3%, emerging markets are growing at almost 5% (see chart to the right). Between 2018 and 2050, the working age population in the emerging markets is expected to increase by 135%, even while the working age population in the developed world is expected to decline by 7%. Population growth, along with productivity improvements, should lead to far better growth in emerging markets over the next thirty years relative to the United States and other industrialized countries. While the U.S. bull market continues to rage on, emerging markets have already experienced a significant correction this year, after also experiencing a significant correction in 2015. Emerging markets have been weak in 2018 due largely to increasing interest rates and spreading worries about a full-fledged trade war. In the United States, too, interest rates are starting to affect housing markets, auto sales, and credit card default rates, but the stock market generated a positive return during the first nine months of the year. During that same period, Brazil’s stock market and China’s stock market have declined by 13.7% and 19.3%, respectively. Even South Korea has not been spared, although its stock market is down much less. We believe it is likely that emerging market stocks will soon start to recover or U.S. stocks will soon experience a correction similar to that of many emerging markets. The world has changed considerably as a result of the growth of emerging markets over the past 20 years. Emerging markets represent 59% of the global economy today vs. just 43% in 1998, while the United States represents 15% of the global economy today vs. 20% in 1998. Emerging market countries have become richer, and their middle-classes have increased commensurately; by 2020, China and India will represent two of the top three largest middle-class populations in the world. At the same time, emerging market economies are evolving away from low cost, labor-intensive industries and towards technology, the service sector, and consumer-driven industries. The valuation discrepancy between U.S. stocks and emerging market stocks is currently larger than at almost any time in recent history. Currently, the U.S. stock market is trading at a cyclically-adjusted P/E (CAPE) multiple of 32.5x earnings. The solitary two times in history that the S&P 500 Index was more expensive by that measure were 1) the peak of the Dot-Com bubble in 2000 and 2) the stock market peak in 1929. Investors would be wise to remember how poor stock returns were subsequent to those valuation peaks. Meanwhile, the MSCI emerging market stock index has appreciated by just 1.1% per annum during the past eleven years, despite much faster GDP growth; emerging market stocks are currently trading at a cyclically-adjusted P/E ratio of just 16.3x, which is near a trough valuation level rather than a peak level. Put simply, emerging market stocks are currently trading at almost a 50% discount to their U.S. brethren. Growing U.S. current account and Federal budget deficits should contribute to dollar weakness in the years ahead, especially given that foreign central banks (in aggregate) seemingly chose to discontinue financing U.S. borrowing by purchasing more U.S. Treasuries beginning in 2013. China and Europe appear committed to importing energy on world markets using the Chinese Renminbi and the Euro as the transaction currency, respectively, rather than the U.S. dollar. 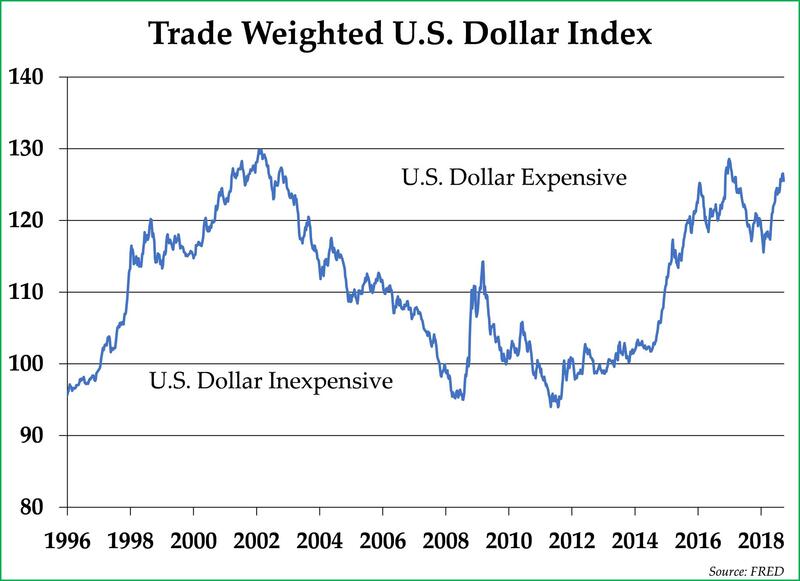 As the U.S. dollar is used less often for cross-border transactions in the years ahead, lower demand for U.S. dollars should lead to commensurate adjustments in U.S. dollar foreign exchange rates. Several valuation indicators such as The Economist’s Big Mac Index suggest that the U.S. dollar is overvalued versus other currencies. Investing in emerging market stocks involves risk, not only because the share prices of emerging market stocks can be volatile on their own, but they are also subject to fluctuations in currency exchange rates which can also be volatile. Despite the large valuation discrepancy, we do not know whether emerging market stocks have bottomed or whether U.S. stocks are near their top. With that said, as long-term investors, we think the risk-reward profile in many cases in emerging market stocks exceeds that of owning overvalued U.S. stocks. Our approach has been to scale into our emerging market positions gradually as an increasing number of stocks appear increasingly undervalued. With those risk disclaimers out of the way, we are excited to have a growing number of prospective investments that are starting to look interesting to us. We agree with Buffett that markets are not efficient all of the time, and we think emerging markets represent an attractive long-term investment opportunity at today’s depressed share prices. We are excited to announce that our firm’s name will change from “Pekin Singer Strauss Asset Management” to “Pekin Hardy Strauss Wealth Management” effective February 1, 2019. The new name will reflect Brandon Hardy’s important ongoing role at at the firm while using the more modern term, “wealth management,” to describe the work we perform on behalf of our wealth management clients. With the name change, our website and email addresses will change accordingly, although our existing website and email addresses will continue to work perfectly well. Nothing else will change at the firm or in our mission to give you personalized attention and prudent stewardship of your capital. As always, we appreciate your trust, your patience, and your long-term outlook. If you have any questions about the ideas we have shared this letter or about your investment portfolio, please do not hesitate to contact us. When we use the term “emerging market stocks,” we are talking about the stocks of companies which are headquartered in Latin America, Eastern Europe, and Asia in countries such as Mexico, Brazil, China, Russia, Israel, Turkey, and, yes, South Korea as well. Source: World Economic Outlook, IMF. 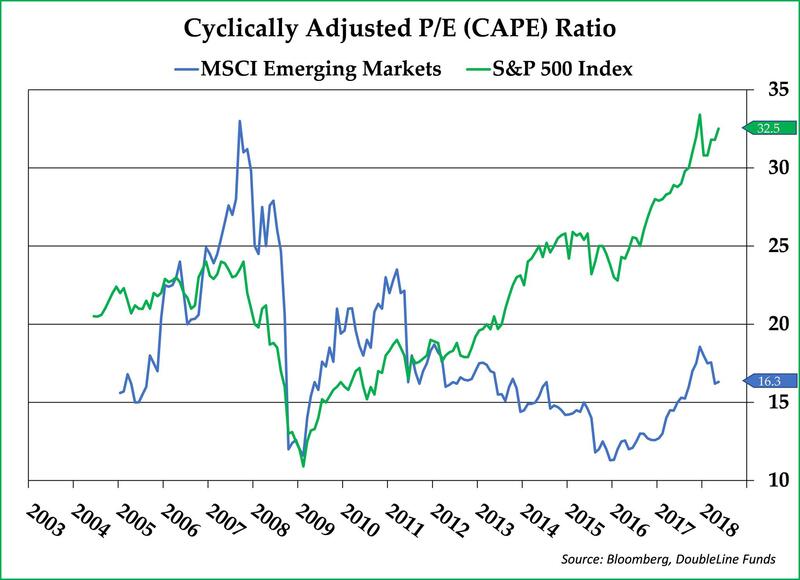 The cyclically-adjusted P/E (CAPE) ratio is a valuation measure that takes into account 10 years of earnings adjusted for inflation. If P/E ratios, profit margins, and inflation rates are mean reverting, and we believe that they are, this measure is a useful indicator of forward-looking equity returns. The lower the CAPE ratio, the more likely it is that 10-year forward returns will be attractive. The higher the CAPE ratio, the more likely it is that 10-year forward returns will be lower than historical returns. This commentary is prepared by Pekin Hardy Strauss, Inc. (“Pekin Hardy”) for informational purposes only. Pekin Hardy Strauss, Inc. does business as Pekin Hardy Strauss Wealth Management, encompassing financial planning and separate account management services for individuals and families, and as Appleseed Capital, the firm’s institutionally-focused arm. The information contained herein is neither investment advice nor a legal opinion. The views expressed are those of the authors as of the date of publication of this report, and are subject to change at any time due to changes in market or economic conditions. Although information has been obtained from and is based upon sources Pekin Hardy believes to be reliable, we do not guarantee its accuracy. There are no assurances that any predicted results will actually occur. Past performance is no guarantee of future results. The S&P 500 Index measures an index of 500 stocks chosen for market size, liquidity and industry grouping, among other factors. The MSCI Emerging Markets Index is an index that consists of indices in 24 emerging economies: Brazil, Chile, China, Colombia, Czech Republic, Egypt, Greece, Hungary, India, Indonesia, Korea, Malaysia, Mexico, Pakistan, Peru, Philippines, Poland, Russia, South Africa, Qatar, Taiwan, Thailand, Turkey and the United Arab Emirates.